Our general requirements ensure egg donors a positive and rewarding experience throughout the egg donation cycle. Without question, egg donation is a rewarding experience, offering the incredible gift of parenthood to hopeful parents, while providing egg donors the financial freedom to transform dreams into reality. In order to be considered as a potential egg donor candidate with our egg donor agency, please review our list of general egg donor qualifications below. BE BETWEEN THE AGES OF 19-30 YEARS OLD. Within this age range, you are most likely to respond well to fertility medication, as well as produce healthy eggs, thus providing hopeful parents the best possible chance of success. BE MATURE, RESPONSIBLE, RELIABLE, AND DEPENDABLE. The protocol and plan surrounding an egg donation cycle can be quite complex, with a number of very detailed instructions. Having a heightened understanding of the process, while showing a high degree of maturity, responsibility, reliability, and dependability, is critical to your success and the success of your hopeful parents and their future family. BE PHYSICALLY, MENTALLY, AND EMOTIONALLY HEALTHY. It is important to ensure you are of sound mind and body before beginning the egg donation process, both for your own physical and mental well-being, as well as for the physical and mental well-being of any children born through your donation. 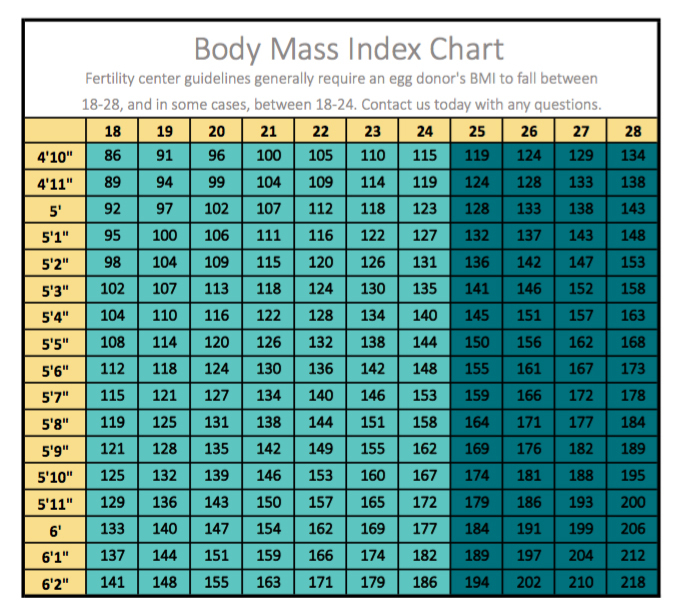 BE WITHIN A BMI RANGE OF 18-28 (see BMI chart). Finding yourself within a healthy BMI range will help ensure your body responds to fertility medications appropriately, and reduces the risk of medical complications during an egg donation cycle. Click HERE to learn more. BE ABLE TO GATHER ACCURATE AND UP-TO-DATE HEALTH INFORMATION REGARDING YOUR IMMEDIATE AND EXTENDED FAMILY. Providing transparent and accurate health information about yourself, as well as your immediate and extended family, is important for to your hopeful parents and for any children born through your donation. BE FREE OF KNOWN GENETIC DISEASES, WITH NO KNOWN GENETIC DISEASES IN YOUR IMMEDIATE FAMILY. This helps minimize the risk of birth defects or serious inherited diseases for any children born through your donation. HAVE NORMAL MONTHLY MENSTRUAL PERIODS. Regular monthly menstrual periods are a signal of a healthy reproductive system, which increases the likelihood of a normal response to medication, as well as better predicts the chance of normal egg quality and quantity at egg retrieval. BE A NON-SMOKER/NON-TOBACCO USER, AND A NON-DRUG USER. Nicotine and recreational drugs are known to cause damage to your body and may impact your egg quality. BE FREE OF SEXUALLY TRANSMITTED DISEASES. Because body tissue (in the form of an embryo) is being transferred to someone else, being free from sexually transmitted diseases prevents the introduction, transmission, and spread of such diseases from one party to another (in this case, to lab technicians, or to a hopeful parent or a gestational surrogate). BE WILLING TO TAKE INJECTABLE MEDICATION. The egg donation process requires the administration of 10-12 days of injectable medication. Click HERE to learn more. Ultimately, the decision to become an egg donor is a worthwhile commitment with the opportunity to create a powerful change in your own life. If you meet the general egg donor qualifications, we invite you to take the next step in the process to become an egg donor. If, after reading through the general egg donor qualifications, you believe egg donation is right for you, you may complete our online egg donor application form.